I have been reading The Luminaries, this year's Man Booker prize winner, this year's present from my secret santa, who happened to be my dear friend who lives in North Carolina, and this month's book club selection. At first, this epic seems a 19th-century detective novel that will reveal itself as you go further into the story; however, six hundred pages in, and the detective story seems less compelling than the sheer artistry of Elizabeth Catton's narrative. Certainly the artifice of astrology plays heavily into her construction of the narrative, as each section wanes into half of the one before it. Opposing characters face off (just as they would in their astrological signs) and keep the luminaries orbiting, leading me to wish that I had taken notes from the get-go with this book; however, by the time all is said and done, the revelations and betrayals of the narrative aren't what keep this book going; it's not even the characters themselves. Instead, Catton's fine writing just makes me want to spend a few more hours in her deft hands. Lucky indeed, for the book does go on, clocking in at over 800 pages. A pleasant way to spend a few, spring-break sponsored, afternoons. I found that as the end careened to its conclusion, I did not want the book to end--an unusual feeling, given that 300 pages prior I had thought I would never make it to the end. (Here are two interesting book reviews, one from The Guardian and the other The New York Times: both of which will do a far better job than my own little discussion). So beyond the book, I have a new cookbook, gifted this past Christmas by one of the fathers-in-law (I have two of those and four mothers-in-law; it took a village to raise that husband), who just so happens to also be a member of the book club. This cookbook comes in part because we have been salivating over his cookbooks. Written by Teresa Barrenechea, this cookbook is delightful. Meant to open the doors for the non-native Spaniard into the homes of Spain and with discrete cultural dishes and established culinary nationalism, the recipes in this book boast of the diversity of Spanish cooking, from Navarra to Andalusia, the Balearic Islands to Murcia. Opening with a gorgeous essay on the culinary history of Spain, this cookbook moves through tapas, soups, pies, stews, fish, meat, poultry and into dessert. She covers it all with some attractive photographs, easy to follow recipes, and little head notes that ground each dish in its region. 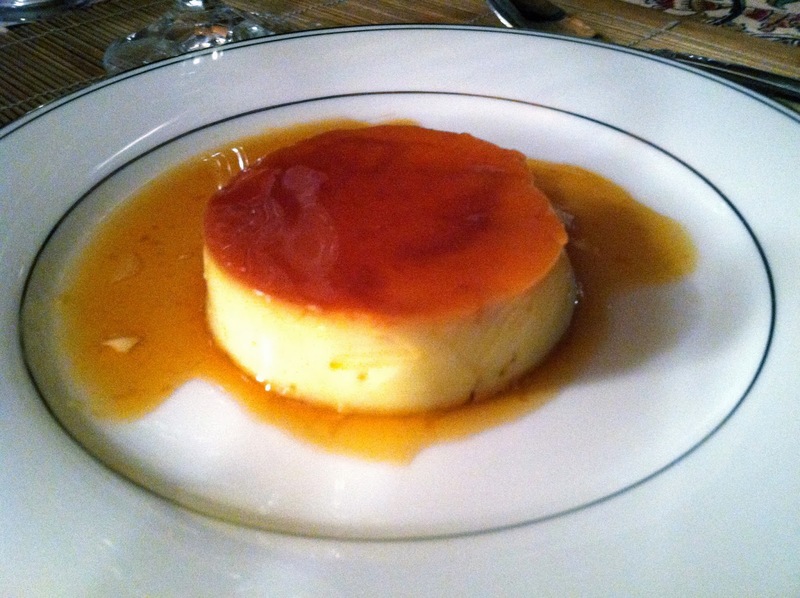 This flan, which is so ubiquitous that it does not boast a singular region, is the classic creme caramel of Spain. Barrenechea advises that it is the basis for a multitude of different flavored flans, where you can substitute another liquid for all or part of the milk--she recommends freshly squeezed orange juice to get that Valencian feel. Perhaps some coffee or chocolate to kick this flan up a notch or two. Or even a splash of vanilla. 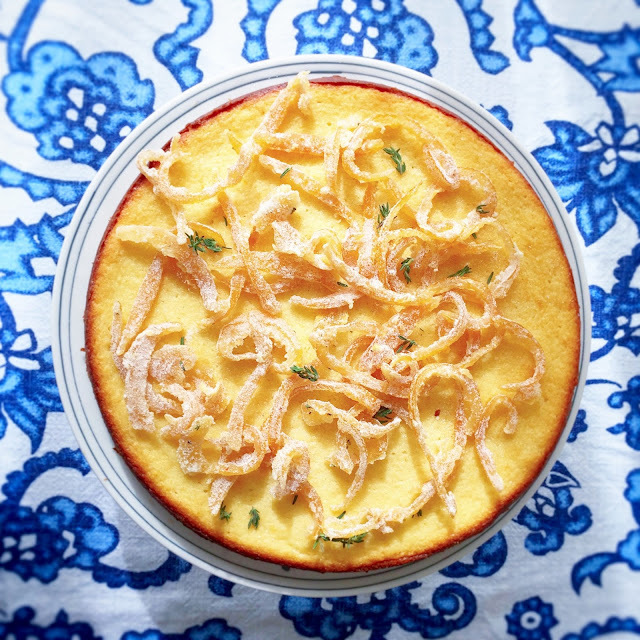 Do make this flan early in the day, so that you can allow it to cool completely before serving. And believe in the syrup. I was convinced that it would not be runny after the fast hardening of the caramel to the ramekin before baking and the subsequent cool down of a few hours after baking. However, as you can see, it turned out just as one would hope flan would do. In sum, it is glorious indeed to have two new books--one a Booker prize winner and the other a fabulous cookbook. I do recommend The Luminaries, should you have the time to devote to it. Perhaps you can get a chunk of it read as you wait for the flan to cool. Now if only summer would come soon so I could spend even more time reading and cooking. 1. Preheat the oven to 300 degrees. Gather 12 ramekins or custard molds. 2. Spread the 1/2 cup granulated sugar evenly in the bottom of a heavy saucepan and place over medium-low heat. It may take several minutes before the sugar begins to melt. Without stirring, watch the sugar closely as it begins to liquefy at the edges. When the liquefied sugar begins to turn from golden to brown, immediately remove the saucepan from the heat. Working swiftly, pour the liquid caramel into the ramekins and tilt to cover the bottom and sides evenly. 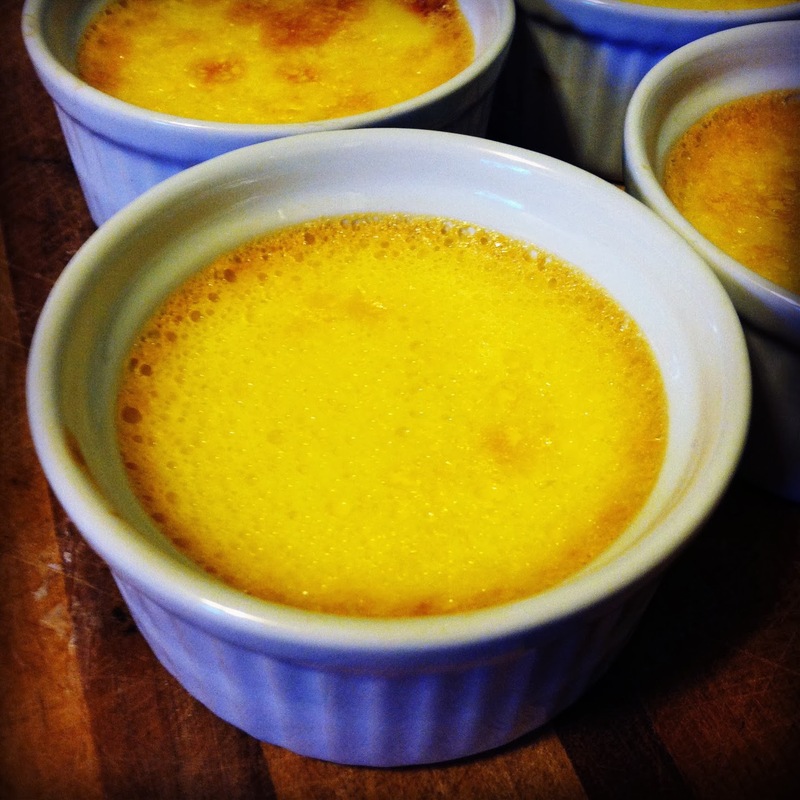 The caramel will harden swiftly when it hits the cold ramekin, so work as quickly as possible. Don't worry too much if you can't spread it prettily or as evenly as you would like. 3. In a saucepan, combine the milk, lemon zest and cinnamon stick over high heat and bring to a boil. Immediately decrease the heat to low and simmer 10 minutes to infuse the milk with the flavor of the seasonings. Remove from the heat and let cool. 4. In a bowl, combine the whole eggs, egg yolks, and granulated sugar, and whisk until foamy. Pour the cooled milk through a fine-mesh sieve held over the egg mixture and whisk until well blended. pour the mixture into the coated custard cups. 5. Arrange the ramekins, not touching, in a large, deep baking pan. Pour water to the dept of about 1 inch in the pan to create a water bath. Carefully put the pan in the oven and bake for 1 1/2 hours or until set when tested with a thin-bladed knife in the center. Carefully remove the custards from the water bath and set aside to cool completely. 6. One at a time, run a knife around the inside of each ramekin to loosen the edges of the custard and then invert the custard onto a dessert plate.